An interesting closing clash of match day 1 of Bundesliga 2016/2017 was held. The youngest coach in Bundesliga history, Julian Nagelsmann, 29 year-old, welcomed the newly promoted rich club, RasenBallsport Leipzig, currently coached by Ralph Hasenhüttl. Nagelsmann opted to play back 4 in a 4-3-3/4-1-4-1 basic shape. Niklas Süle and Fabian Schär filled the CB slot, flanked by Pavel Kaderábek and Patrick Ochs on each side of the backline. In the second line, Kevin Vogt roled as the 6 who stayed behind the first line of Leipzig pressing. At 8, there were Lukas Rupp and Sebastian Ruddy whose displayed different responsibility – to be explained later – in on-possession phases. For the forward trio Nagelsmann chose Sandro Wagner as the central forward supported by the wide-men namely Andrej Kramaric on the left and Mark Uth on the right. Hasenhüttl fielded a 4-2-2-2/4-2-4 Schmidt-like formation. Against Hoffenheim, RBL talented midfielder, Naby Keïta, was unavailable which saw Hasenhüttl to partner Diego Demme with Stephane Ilsanker at 6. Yussuf Poulsen and the pacey Timo Werner as the 9-duo, supported by the indenting wingers, Dominik Kaiser and Marcel Sabitzer. Behind these 4, as mentioned above, Ilsanker and Demme patrolled the 6 post. At back, Hasenhüttl picked Benno Schmidtz, Orban, Marvin Kompper, and Marcel Halstenberg as his first choice. In their early phase of build-up, Ilsanker would occasionally drop to the back line. By doing this Hoffenheim first line of press would have to deal with 3 presence in RBL deep build-up. Kramaric and Uth to deal with the half-backs, Orban and Kompper, whilst Wagner to keep his eyes on Ilsanker who acted as the center-half. Most of RB Leipzig build-up ended up with long ball forward directly to the front line. A well-known approach, something they’ve praticed since the last season, as they got a good physically forward namely Yussuf Poulsen. Not too eficient but at times Poulsen managed to hold up and feeding for the late run for vertical penetration, which created minor trouble within Hoffenheim defensive block. Right behind the forward trio press, Krupp and Rudy stayed on each half-spaces, slightly narrower to both forwards so they could maintain the access to RBL’s wing-backs and 6. By doing this Krupp and Rudy keep the horizontal-compactness remained stable, because they cover the lateral-gap between Wagner and both wide-forwards. There were 2 common scenarios of how Leipzig effort in beating this press. The first one, the ball-carrying central defender tried to distribute to the near half-space where one of the ball-side indented-winger occupied on. But was it possible, given the above diagram doesn’t show any chance of it? The answer is yes. 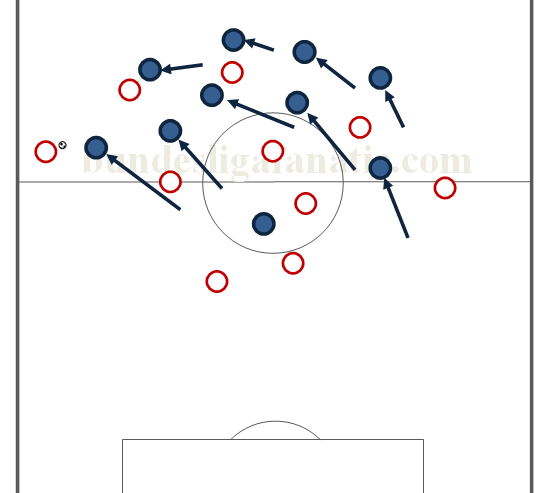 The heavy man-oriented and premature forward press by the 8 had opened such chance for Leipzig’s first line to play the ball to the aforementioned space. It gave RBL a numerically benefit situation. In turn, such pressing mistake made kevin Vogt had to cover a more space and the negative consequence it also unstabled the central area. Vogt caught out of position and RBL made use of it by playing diagonally direct to the intermediate zone in front of the CB’s, this pass enabled Poulsen or Werner had the chance to make a 2v2 situation. Had they able to perform proper quick 1-2 passing movement, Hasenhüttl’s boys might have lead the scoreline. Bad effect of heavy man-oriented. Not only gain access to the half-space, with the right back (RB) moving forward, RBL created numerical advantage as the RB, RW, and CF able to overload TSG’s DM and LB. When such chance didn’t occurred, as expected, RBL would play it long forward towards the 9 or the wide-men. The wide-men here was the wing back. RBL first line played diagonal ball from the back to the pushin forward wing back in the second line. Overall, Hoffenheim were quite good in dealing with this scheme. The horizontal ball-oriented shifting was quick enough to compress the space so they able to stop any progression effort through the wing. Hoffenheim ball-oriented shifting against RBL switch play. This quick shifting, changed the shape from 4-3-3- to 4-1-4-1, enabled Nagelsmann’s boys to be numerically superior (4v3) around ball-side half-space and flank. Nagelsmann looked to press RBL’s first phase build-up and Hasenhüttl had also approached the same way. RBL pressed in a basic shape of 4-2-2-2/4-2-4 in middle-block. A similar strategy with Roger Schmidt initial pressing shape. RBL initial press. The forward duo blocked any central access. The indenting winger stayed on half-space to maintain the access to TSG’s wing back and 8, as well, helping Ilsanker and Demme to supervise any movement of TSG’s 8-duo. Nagelsmann’s progression idea was different to Hasenhüttl’s one. When moving the ball to the upper area, we can see the interchanging movement between 8 and the wide forward. Particularly on the left side, the area of Lukas Rupp. Andrej Kramaric dropped deep to 8 and, occasionally, 6 to pick up the ball. Rupp, as he needed to balance this move, moving up to the upper ground. They changed around half-space and flank. The off the ball movement between 8 and wide forward was quite interesting. They kept moving when the ball reached the wing back as it gave time for Kevin Vogt to come closer and picked the pass. A good approach as it enabled them to overload the ball side area. On the upper area, Hoffenheim tried to occupy the half-space or center at 10 as Angelsmann used it to create the vertical access for their ball-progression. The one to occupy the half-space would have been the wide-men or 8 and the one to fill the 10 in the centra area was, mostly, Sandro Wagner. Hypothetical example of using Sandro Wagner as the central vertical access. Creating passing lane, held the ball up, and fed the onrushing 8 in TSG’s 18-yard box penetration. In the early of the first half, this scheme almost gave them maximum effect. The right flick-on timing from Wagner, who received the pass at 10, in the center, reached the vertical movement of the 8. Unfortunately, they failed to be capitalized. 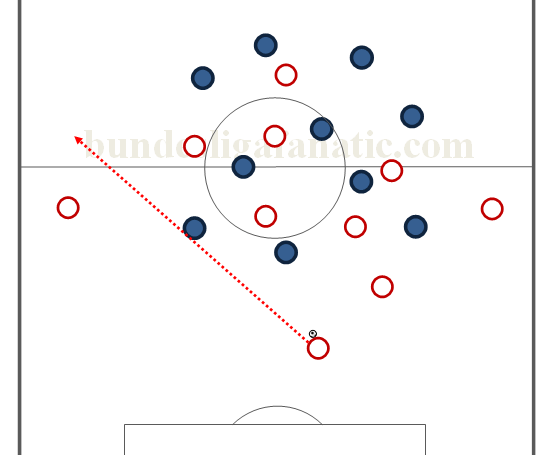 The compactness level within RB Leipzig structural press being one reason of how Nagelsmann’s boys eased to get into the intermediate area between the line. Sometimes the aggresiveness of the wide-man combined with bad forward pressing timing by the wing back behind had also another reason Hoffenheim got the free-pass. From bad to worse the identical issue was also observed in the central area. Vertical gap within RBL pressing block. The aggressiveness of left CM caused by the heavy man-oriented had created space for Mark Uth to receive a pass from the moving-forward central defender (Schar). But, just like their pressing play, Hoffenheim first phase of build-up had not been consistently cleanly practiced too. The issue was bad spacing between players which, in turn, created a lot of vertical gap between the line. 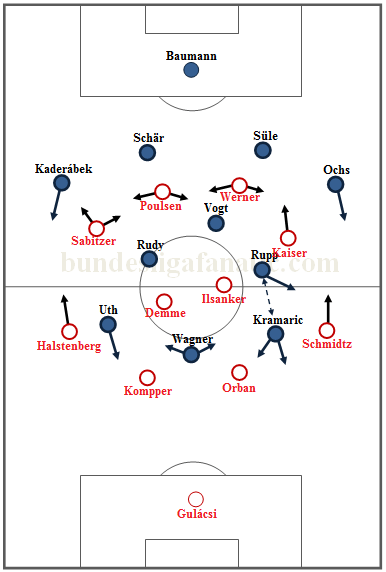 Which also helped RBL upper players to isolate and separate the two first line of Hoffenheim build-up. Niklas Sule Dispossessed in 33 minute was the example. You can say Sule took too risky action by still keeping forward, but the other side of story was the structure was just not enough to provide passing option for Sule. After the break, Nagelsmann made minor change as he replaced Vogt with Pirmin Schwegler. This gave some slight impact to Hoffenheim’s deep circulation. Schwegler was little bit better than Vogt in term of supporting the circulation and progression. He shifted horizontally slightly better. But afterall, it didn’t create any major impact for TSG’s attack. Some individual mistake played its own part in goals. The third goal of the match was started by a miss ball control that gave a chance for TSG to counter. The equalizer in the final minute also saw the late movement of Patrick Ochs in closing the wide space next to his left which led to the assist by Kaiser. Spatial compactness level been the issue for both team. A must improve one by the head coaches as it would be surely crucial for their long term journey. Not a spectacular match but still an entertaining one. This entry was posted in tactic and tagged Bundesliga, Hoffenheim, Julian Nagelsmann, RB Leipzig, Tactical analysis, Youngest coach. Bookmark the permalink.